According to a good friend, those are the essential textures in any dessert. I tend to agree. 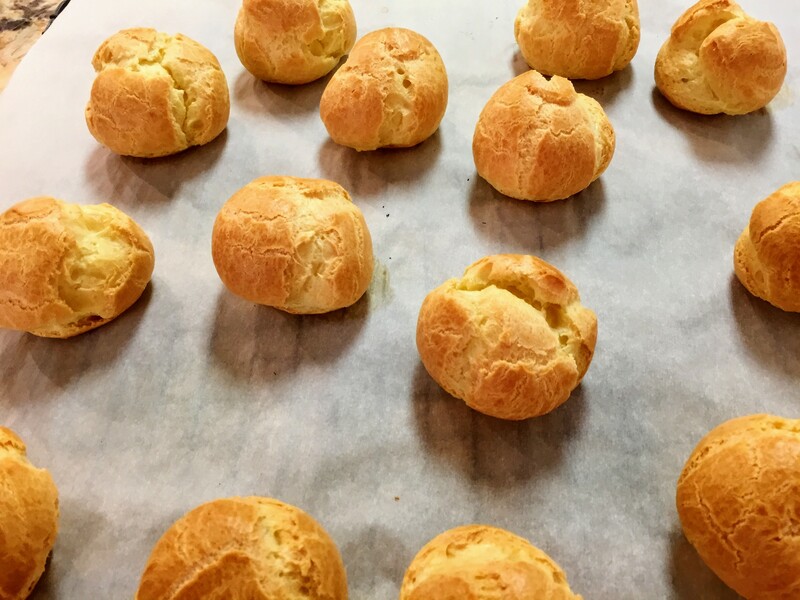 Choux pastry is a great blank canvass for getting all of these. You can pipe the dough into lots of shapes depending on what you plan to fill them with. I prefer the classic cream puff shape. It’s quick to make and easy to fill. The larger the puff, the more of a chance there is that they won’t puff properly and you won’t be able to fill them with all the goodness they deserve. I like to keep it simple and fill mine with whipped cream. Sometimes I add in some matcha powder for green tea puffs. Dust the tops with powdered sugar or cocoa powder for presentation. Just make sure they are fully cool before filling and decorating or you will have a gloopy mess. If you aren’t feeling like dessert, leave out the sugar from the dough and fill these babies with cream cheese, chives, and smoked salmon. I’ll admit, sometimes, I eat them without any filling just for the crunch! Hawaii has a love of a special choux pastry creation called the Coco Puff from Liliha Bakery but I haven’t managed to reproduce those yet. If only I could! These can make even the angriest person your best friend with just one bite! No matter what you do with them, don’t be intimidated by the multi-step dough. These really are an easy, delicious, and impressive looking dessert for sharing with a crowd! Optional: Fill with whipped cream or pastry cream. For a savory version, leave out the sugar and fill with cream cheese, chives, and smoked salmon. Use a bigger pot than you expect to need, that way you can stir aggressively without the dough splashing everywhere! Crack the eggs into a bowl one by one to make sure you don’t get any shells in the dough. Use a stand mixer so you don’t have to burn out your arm muscles. The dough will be smooth and shiny when it is ready for the oven. Put the dough into a bag and cut off one corner so you don’t have to wash a pastry bag. Wet your finger and pat down the puffs before baking.